After lunch we stopped at Independence Marsh, where we found the Shooting Star. Click here to read the trip report. Click here to read the bird sightings list. Click here to read the trip report from the Linn Run outing. Click here to read the trip report from the April 12, 2015 outing. Registration is NOT required. Everyone is welcome, including non-members. Trips last 3-4 hours but you can leave at any time. Bring sturdy walking shoes, water, and an umbrella, if necessary. Directions: From Pittsburgh, take the PA Turnpike east to Exit 91/Donegal. Turn left onto PA 31 and then, after a short distance, left onto PA 711 north for about 9 miles. Turn right onto Darlington Road (this may be unmarked) and travel about 1 mile to its junction with PA 381. Continue straight onto PA 381 for a short distance and then turn right onto Linn Run road. 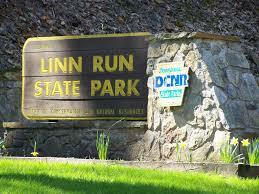 Once you enter Linn Run State Park, continue about 1.5 miles to the Grove Run Picnic Area on the right, where we will meet. 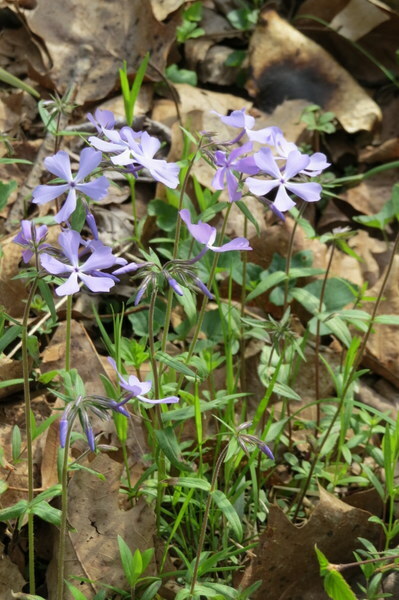 April 25, Saturday, 9:00 AM Indian Creek Wildflower Walk Leader: Lisa Smith rain or shine. We cover about a mile and a half at a very gentle pace on relatively flat terrain. The walk normally lasts until around noon. Directions: PA Turnpike to Donegal, left onto Rt. 31, Right onto Rte.711, left onto Rt. 381 at Normalville at the “t”, go 2 miles, cross Iron Bridge, Make a right at the sign for Camp Christian. Go to the end of the road and park to the right by gated trail. 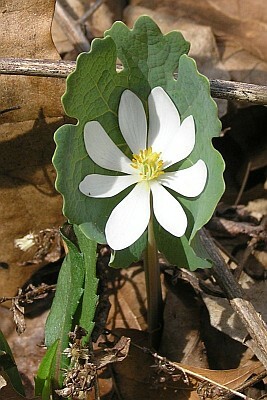 April 26, Sunday, 8:00 AM Enlow Fork Wildflower Walk by Wheeling Watershed Conservancy. Directions from Pittsburgh and points North: I-79S to I-70W at Washington, PA. to Rt. 40E. turn right onto Franklin Farms Rd just past Washington Crown Center. Go about 1.0 mile make a right onto Rt. 18S, through Prosperity and Old Concord into Greene County. About a mile after you enter Greene County, Rt. 18 makes a very sharp curve to the left at Beulah Church. Make a right onto the road where there is a sign pointing to Ryerson Station State Park ( be careful not to take the first right turn) just before the cemetery. Follow that road to Graysville ( there is a point where the main road goes to the right, so be sure to stay on the main road.) When you come to a “T” in Graysville, make a right on an unnamed street and look for the signs that point to Rt.21W. Take Rt. 21W for a couple miles toward Wind Ridge. Right before Wind Ridge, make a right onto Nebo Ridge Road ( there is a farmhouse here on the right with stone siding on it). Follow Nebo Ridge Rd. for several miles. The Road will make a sweeping curve to the left and you’ll come to a group of houses ( old cars and junk lying around). Turn right onto Walker Hill Road. Go about 1/8 mile, make a sharp left onto Smoky Row Lane (formerly a rugged dirt road; paved in 2014!) at the sign for the State Gamelands; follow that downhill, through an S curve at the coal mine facility, then onto Enlow Fork. Go as far as you can, till y o come to a gate, and a parking lot. Do not stop at the first lot on the left or you’ll have a few hundred yards of walking to do. Directions from Morgantown, WV and points south and east: Take the Waynesburg exit off I0-70 to Rt. 21W. After about a mile, Rt. 21 merges with rt. 19 N. Follow that into and through Waynesburg. Be sure to stay on Rt.21 W. Then follow the above directions from Wind Ridge to Nebo ridge Rd. etc. Meet at the parking lot of the wildflower reserve for this outing in search of early spring migrants, early wildflowers, courting amphibians and other signs of spring. Bring a bag lunch. Directions: It is about 25 miles from Pittsburgh. Take Parkway West to US 22, exit to Rt. 30 . Stay on Rt. 30 for a long distance (20+ miles) . Then turn into the wildflower parking lot is on the right hand side. there is a sign immediately before the turn.